all of the Rules, and read them carefully. On Rag & Bone, you can choose what characters that you want to put into the Reaping at the Tesserae Claims. There you will claim Tesserae, for the characters you want to go in, and claim safe the characters that you don't. However once your character has reached the age of 19, they are no longer reapable. For the reaping is only for ages 12 to 18. 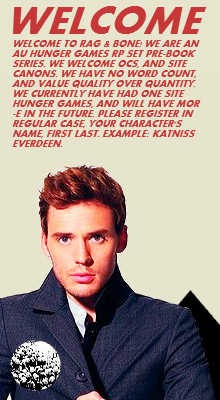 Once the Reapings happen, you are allowed to volunteer your character if you want, but you must use the volunteer code so we know that your character is volunteering. However, if the reason isn't realistic, we do have the right to help you change it, or just not let you volunteer if you change your mind. The Reapings are live, meaning that we post in the District with a real Reaping, that is determined by random.org. Below there are different sections you can read about the actual Hunger Games, and learn more about them. The rules can change at times because we think of new things to add, remove, or alter to make the Games more fair, and better for you to play. On Rag & Bone, Hunger Games generally will last 4-5 days in character. These are known as Game Days. One Game Day is one week (7 days) in real life. This is somewhere around a month for a Hunger Games to take place. Each Game Day usually starts on a Sunday. Once the next Game Day comes, your character should start transitioning from the day before to the next in a new thread. 5. Being the Victim of an Event in the Arena. For Fighting, these are the colors based on HP. 1. Arena Deathlist: Shows how likely a tribute to be killed by the Arena. This includes muttations and events as well. 2. Natural Deathlist: Shows how likely a tribute is to die of Natural Causes. This includes starvation, dehydration, and sickness. 3. Fightning Deathlist: Shows how likely a tribute is to die because of a Fight. 1. Green: A tribute is least likely to die because of this. 2. Yellow: A tribute is somewhat least likely to die because of this. 3. Orange: A tribute is almost likely to die because of this. 4. Red: A tribute is most likely to die because of this. However, these aren't always the outcome. It depends on the odds. There are contributing factors to each Deathlist as well. These include what Tributes your tribute is by, what their colors are, what your tribute's Health Points is, and more. In our Hunger Games, we like to base things on realism. This is why we have dice for you to roll based upon your Deathlist. To roll dice you can't do a quick reply. It has to be a regular reply, so you have to actually click Reply first. If you try to aim for these places before that time, your Tribute will lose Health Points. You also must always use the Fighting Code, and Ending Fight codes. Remember that fights can last as long as you want. However, use the CODE, and roll your COLOR! After rolling FD (Fighting Deathlist), you will get one of three results. 1. Full Damage -6 Health Points: This means that the Tribute's attempt to hit where they wanted was perfect. 2. Half Damage -3 Health Points: This means that the Tribute's attempt to hit where they wanted was slightly off. 3. Miss -0 Health Points: This means that the Tribute's attempt to hit where they wanted was a complete miss and didn't cause any damage to the other Tribute. Remember to keep Track of your HP during fights. Because sometimes your color can change if you are close to changing during the fight. When fighting, you always use the code for Fighting, and when ending a fight, you always use the code for that. Remember that when you're ending a fight, if you're trying to kill the Tribute, you always roll the Death Move (DM). You must also use the Fighting Deathlist (FD) roll for fighting. REMEMBER TO ROLL YOUR COLOR! Remember that you must be realistic and don't give your Tribute more power than they actually have, base everything on your HP and your FD during fighting. If your Tribute has low health and FD, they won't be able to swing forcefully, their swings will be more limp like. **If you have a shield, or some sort of thing that can block you (ask if you're unsure, we will tell you if you try to use something that isn't considered a blocking item), you can only block one Full Damage. So if someone rolls a full damage on you, then you can block it. After that, all your blocks for full damage are gone. 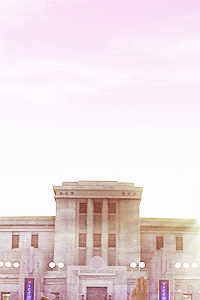 After the Reaping, Tributes are taken to the Capitol for what is called the Pre-Games. There are events that happen that get Panem excited for the Games that is about to happen. Our Pre-Games lasts two weeks, and the first Game Day the week after. You will go through everything with your Tribute. The Parade, Interviews, Training, Gamemaker Sessions, everything. You will almost feel like you are the Tribute. Which is a part of roleplaying right? Activity during the Pre-Games is a huge factor when it comes to your Tribute's Score. If you are not active during the Pre-Games, you could become Bloodbath Fodder. After the Pre-Games, it's time for the Games to begin! At the Bloodbath, you will attempt to claim items, get into fights, and run away. Any combination! However, everyone is required to do an entry post. If you don't make an entry post, and just go claiming or trying to fight, you'll be asked to start over. Once you post, you must wait for three other people to post (or 24 hours if not enough people post) before you may post again. If you are playing multiple Tributes (including NPCs if you are posting for them), each Tribute counts as a different person. So if you're playing Sarah and Lukas, if you post for Sarah and then Lukas in a row, you'll only need to wait 2 more posts to post with Sarah, and 3 for Lukas. In this case, Sarah does count as the third post for Lukas in which after you post for Sarah, you post for Lukas. It's a pattern. More rules will be explained in the Bloodbath Thread. The same fighting rules from the section "How to Play" still apply. Any additions will be added most likely in this section if we see things that need to be addressed about fights that happen in the Arena. After a Game Day finishes, at the start of the next, a Games Update will be posted about who died in that Day, events that happened, and anything else we deem important to announce. There will also be a Death Quota posted at the beginning of each Game Day. The Death Quota, also known as DQ tells how many Tributes must die in that day. If the amount is not reached or exceeded, Arena Deaths will happen the next day. 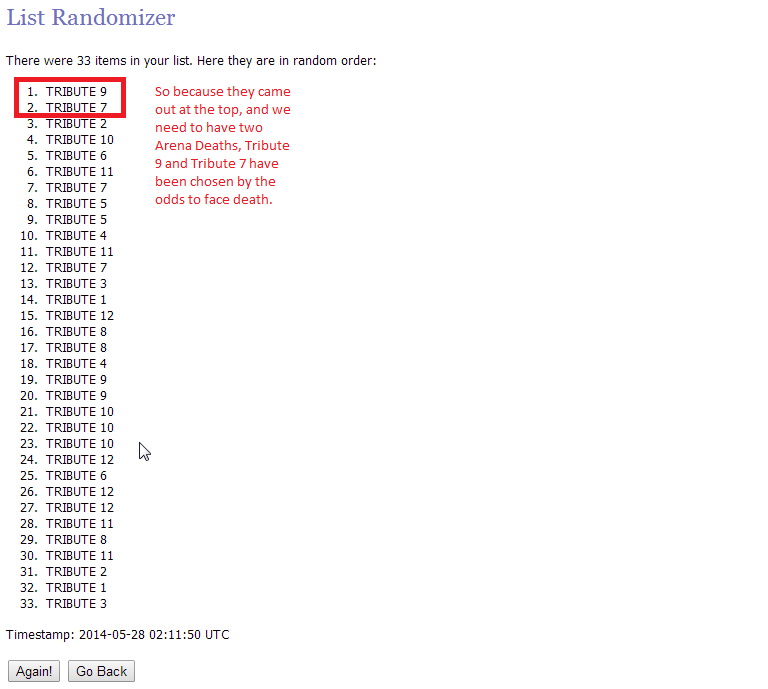 The Tributes are selected by a random choosing, on random.org, just like the Reaping. Let's say that 5 Tributes were supposed to die the day before. But only 3 did. That means 2 Tributes must die today by the Arena, plus the new Death Quota number. This random choosing of course is created based upon your Arena Deathlist Color. How we Do It: Step One. Step Two. Sometimes in the Arena, Muttations and Arena Events will come. These usually do not come for any apparent reason. The Gamemakers most likely didn't like something the Tributes did. 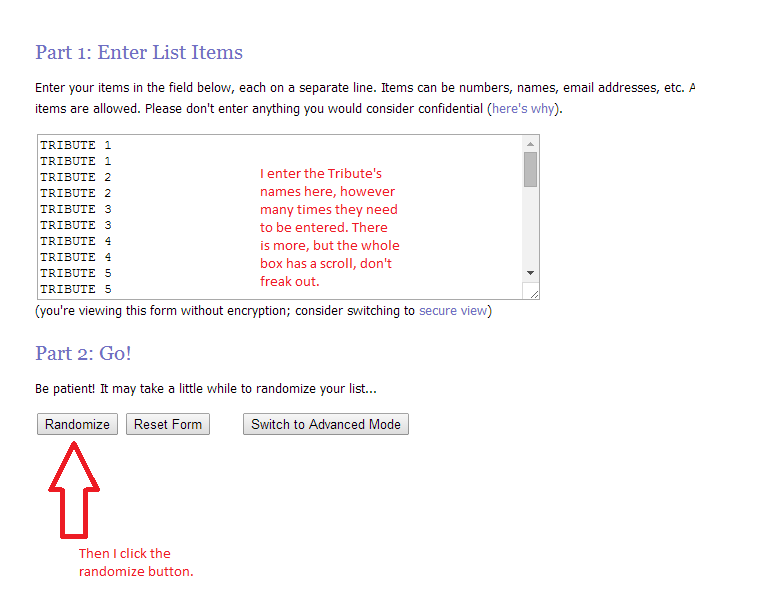 To try to get away from Muttations & Events, you roll ESC (Escaping) and your color for the Arena Deathlist. Remember, that if the event or muttation is considered inescapable, you may not try to escape. The Finale is considered to be the last big fight of the Games. Usually, the Gamemakers pull together all of the remaining Tributes in some sort of fashion to the center of the Arena once they feel that the Games should conclude. Rules for this Finale are simple, fighting. There is no posting order, however you do have to wait for someone else to post before you like regular roleplaying, taking turns. If someone takes too long to post, their turn will be skipped. If someone becomes inactive during the Finale, their Tribute will die.